Last spring, while I was at a family party, one of my sisters -in- law made some steak sandwiches. She bought the buns, and made the meat in her crock pot. Well, my mind instantly went to the dutch oven. I started thinking of how I could make the same thing. But just doing the meat and the veggies would be too easy, of course. I needed to challenge myself. So, I decided that I would make the buns, too. Well, that's all well and good, but I just filed it away in my list of ideas. Until last week, as I was contemplating what to make this week. I hadn't really tried anything new lately. I did a bigger batch of tamales for my wife's scrapbooking party, and there was the jambalaya a bit before that. Not much to write about, not much to read about, eh? So, I found a recipe for hoagie rolls, and I'd gotten some meat and veggies. I was ready to give it a try! 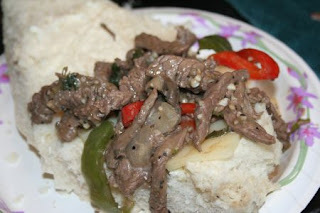 Dutch Oven Philly Steak Sandwiches. I started by mixing a half cup of warm water with the yeast and a Tbsp of sugar. I left it to foam up, and it did, pretty readily (about 5 minutes). Then, in a mixing bowl, I put the rest of the water, the rest of the sugar, the oil, and the salt. To that, I added the yeast mixture. I dumped in the first four cups of flour and started mixing. It was quite sticky, of course, as I stirred. I started adding the rest of the flour a cup at a time, stirring and mixing as I went. I used pretty much the full 8 cups. After it had stirred, I started kneading it until it all stuck together in a ball. Then I pulled it out of the bowl and set it onto the floured table, and started kneading in earnest. I kneaded for about 5-6 minutes, sprinkling on a little bit of flour as it needed it to keep from sticking. I scraped out the bowl and sprayed it with oil and put in the dough ball. I finished that off by spraying the top of the dough and covering it all with a plastic bag. After about 45 minutes I was surprised to see how much it had risen. I mean, most of the bread recipes I've made don't rise that much at all, and I let them sit sometimes for as much as 2-3 hours. So, I started the coals on fire. I was a bit nervous about that, because it was sprinkling rain when I started them. But I could see it was moving over quickly, and the showers would be scattered. As it turned out, that was the last of the rain today. Back to the dough. I punched it down and cut it into 8 equal pieces. In retrospect, I'd probably do 10 or 12, just to keep them from being so big. I rolled them in my hands, and cut diagonal slices across the top. I'd read that it allows the steam to escape the bread. I put them into the 12" dutch ovens as best I could. I tried to make at least an empty inch between each long dough ball. I too the ovens outside, and let them sit, "proofing" the bread for another 15-20 minutes or so, while the coals got hot. 1 to 1 1/2 lbs finely sliced steak beef. I used "stir fry" beef, but I'm told you can get any cut of beef sliced Philly-style. I put the 10" dutch oven on a bed of coals, and packed them in underneath as best I could. Then I dumped in the meat pieces with the oil. I just cooked that, browning it, with a bit of stirring until it was pretty much cooked through. I also added the liberal shakes of the steak seasoning here. While that was cooking, in between stirrings, I jumped inside and sliced up the veggie ingredients. The jalapenos I sliced pretty thin, and halved them. I don't like to get a big bite of chile surprise, but I do like the edge it gives the rest of the food. I put all the veggies in, and stirred it all up. I cooked it, covered, and stirred it occasionally. Meanwhile, the bread was cooking. The coals count should have brought it up to 400 degrees. I baked it for about a half hour. After about 20 minutes, I pulled the dutch ovens off the coals, and let it continue baking with just the top heat. Next time, however, I think I'll keep it on the heat the full half hour, as the bottoms were a bit soft. Not really doughy, but not as crisp as I'd have liked. Still, the entire buns were done all the way through. I let them sit in the hot ovens, after I took the top heat off, for about another five minutes or so, just to let it finish. Then I took them out of the pots to let them cool and air out a little bit. By this time, the veggies were cooked down pretty nicely. There was some water in it from the veggies and the meat, so I sprinkled on a little flour to thicken it up. My wife suggested a bit more "sauce" as we were eating, so I included the suggestion of a little water in the dutch oven as it's cooking. But I'm not convinced it needed it. Finally, it was all ready to serve! We sliced open the buns, with a little mayo and mustard (not too much, to compete with the meat's own flavor), and topped with some swiss cheese. I was amazed. I think it was one of the best hot sandwiches I have ever tasted. And it was filling, too. I had a full one, and I finished half of my son's, and I was stuffed. I couldn't eat another bite to save my life. Hours later, I'm still full, just starting to feel like I could have a little som'pm som'pm for dessert.